Central Otago sure knows how to put on a good show. Flitting between seminars in the lakeside town of Queenstown, lunches and tastings in the vineyards and dinners in spectacular settings like the Skyline restaurant (reached by cable car and with the most extraordinary views over Queenstown and Lake Wakatipu) The Pinot Noir Celebration is just that: not just a deadly serious contemplation of the world’s most obsessively adored wine grape, but one hell of a three-day party (view from the Skyline, right). 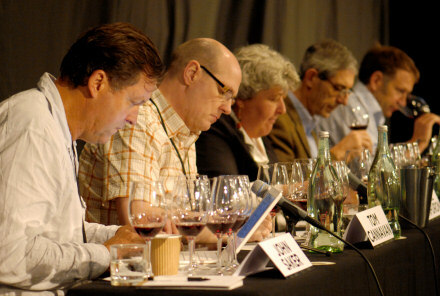 Perhaps the most remarkable thing about the Celebration, which is organised by Central Otago’s winemakers, is the generosity of spirit: the local wines are at the heart of the event of course, but those attending soon discover that the Pinots of other New Zealand regions and from Burgundy and around the world are given due prominence too. The Grand tasting. from which these notes are taken, is held out in the vineyards with Central Otago’s winemakers there to pour and discuss their wines. See more at www.pinotcelebration.co.nz. This was my second day in New Zealand after a long flight from the UK, and two very early starts. My usual tasting stamina collapsed somewhat in face of the 80+ wines on show, so my apologies for those that were missed. See all Central Otago wines on wine-searcher. This is the entry level wine from Akarua, made from estate and purchased fruit. It is bursting with ripe, vibrant raspberry fruit; a real raspberry ripple creaminess and sultry depth. On the palate the fruit retains that pertness and brightness, with whisps of smoky oak, but really it is all about crisp, juicy fruit and nicely done. 89/100. Very fine, nicely vegetal and gamy edges here, with sweet, ripe fruit and delicious life and energy on the palate. Great sweetness to the fruit, a little spice and juicy persistence. 91/100. Winemaker Matt Connell makes a selection of his best barrels for this reserve wine, the Bannockburn fruit delivering a weight 14.7% alcohol in this vintage. It is sumptuous stuff, the limpid, rippling pool of velvety black fruit disrupted by little floral notes, some beetroot and rhubarb vegetal quality and a swirling smokiness of oak. On the palate this is super sweet and ripe, but it’s not sugar that’s doing it, it’s all fruit: dense, mocha-touched plum and blackberry, with super-silky tannins and lovely acidity, and that seamless smokiness of the oak. A massive wine, and yet it wears it very elegantly indeed. 94/100. The first vintage of vines planted in 2003. 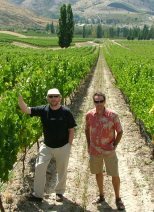 With the Vintner in UK (Tom Gilby). Lovely delicate but fruity nose, but chocolaty and creamy too, with an earthiness and on the palate lovely fruit and creamy focused and silky tannins. Lovely natural concentration here and great depth of fruit. 91/100. Slightly more mineral, smoky character here, a little bit of charry quality, and the fruit still there. More edgy than the 2008 perhaps, hinting at more structure and complexity, though without the seductive creaminess at this stage – though the ripe fruit is all there and suggests this will age nicely. 91/100. Nice briar, woodsmoke and charry notes, but not overdone. A little gamy influence too. The palate has nice fruit sweetness, the tannins and acidity very grippy, leaving this perhaps just a touch too assertive, but a very nice wine. 90/100. Ted Lemson of Sonoma, slightly closed but opens nicely with air. Beautiful fruit comes theough: lots of cherry and chocolate, soicy too, the palate showing great depth of fruit and despite having plenty of stuffing, a nicely fresh edge. 91/100. Discreet, elegant and immediately sugghests a subtle and fleshy fruit-driven style. The palate has lovely fruit: spicy, but abundantly fresh and has really nice weight and harmony. 90/100. Much more new oak here, and a much spicier, meatier character, as well as having little floral and almost rose-hip nuances. The palate has good fruit and that hint of kirsch-like, lively fruit. This is complex, if the oak a little overdone for me and would be better with a touch less. 91/100. Lovely floral, bright lift to this. Slightly herbal character which fits in nicely. Really nice on the palate, with silky weight, smooth, juicy fruit but a lovely undertow of sweet, damp earthiness. Lovely, natural balance, if the merest touch of underripeness to the tannins. 89/100. Deliciously attractive, with a soft bracken and sweet earth edge. A very nice creaminess to the fruit and delicious strawberry softness. The palate has fantastic juicy clarity, with elegant tannins and such beautiful length. 93/100. The wiinemaking regime here has changed totally, with whole bunches, wild ferment and oak hugely reduced. This has a really delicate colour and woodsmoke and super-sweet, soft strawberry fruit. The elegance continues on the palate, with immensely charming, sweet fruit focus. Delicious and exquisite. 94/100. Second vintage. Very nice nose, with a little touch of gamy quality and an atyractively vegetal appeal. Fruit has sweetness on the palate, and though it is perhaps a little dilute, a very charming wine with life ahead of it. 90/100. Attractive, medium nose with elegant fruit and a briary touch, though I feel this doesn’t quite have the flesh for the rather high acidity. 88/100. Lovely soft nose, earthy, ripe strawberry aromas and a certain cherry brightness over a subtle, smooth vanilla. The palate has delicious fruit too. This is very fruit focused, with elegant tannins and a liquorice twist of concentration, and although it is quite a big style, it has elegance. 90/100. An elegant pinot this, with more of the sweet damp earth and undergrowthy character evident than in the 2008. Delightful fruit, retaining a real juiciness and vitality, powering through beautifully. 92/100. Lovely nose, smoky and charry, lots ogf charming berry fruit. The palate has a plush, round, sweet appeal in a very charming and well balanced wine. 90/100. A little more oak evident at this stage, but the fruit is lovely, with really nice, plump, charming berries just smoothed by vanilla. Another lovely drinking pinot, and whilst not showing the complexity of some, absolutely delicious. 91/100. Has the coffeish overlay of oak at this stage, but also nicely plush fruit. That typical block 3 minerality comes through, giving a smoky edge. The palate has delightful balance: it’s a poewerful, yoithful block r, but already the finesse of the tannins and the pert, sweet cherry fruit and acidity ae lovely. 93/100. Lovely vegetal, open, earthy sweetness, the fruit lovely and bold, a tiny bloody edge of ripeness and sweet cherry acidity very fine. The tight, focvcused minerality is there into the finish with tight, fine tannins. 91/100. Smoky, charcoally, intensely mineral nose with very deep, juciy black cherry and blackberry fruit. Lovely depth and density. Fabulous palate just brimming with cedar and touches of espresso, and with delicious length. Fabulous stuff. 94/100. Gamey and bold, with touches of coffee and sweet damp earth, and still that bold black fruit concentration. The palate has huge depth too, perhaps a little more powerfully concentrated than the 2005, the tannins a little firmer, but I find the 2005 has lovely elegant concentration. 93/100. Bannockburn fruit. Very soft, smoky light-coloured wine with gently gamy and herbal notes weaving through red berries. The palate has delightful fruit sweetness, the smooth, tight tannins and tight-grained chocolaty oak all underpinning. Very stylish. 92/100. Gibbston Valley fruit from 28 year old vines. Alan Brady’s original plantings. Beautifully composed nose, with meaty and gamy edges, a lovely hinyt of truffle and ripe, red berry fruit. The palate has lovely finesse: the tannins are super fine, the cherry acidity gently assertive ands trhe coffeeish oak just supporting. 93/100. I like the gently vegetal tones, the sweet juicy fruit and the lively personality here. It displays anice acidity and linearity, with a long, focused finish. 91/100. Delightful freshness and lightness in this pale-coloured, elicatye and spicy pinot. The palate has the same, vital juiciness as the 08, but perhaps ramps up the concentration slightly. Lovely clarity again thogh. 91/100. Not in UK. Delicate, toucvhed with herbs but a fresh cherryish quality. The palate is firm and juicy, with a delightfully firm, fresh but sweet fruit core. Very nice drinking. 90/100. Quite a lot of smoky, schisty quite mineral character here, with fine, refined raspberry fruit. Keenly focused on the palate with a juicy cherry acidity giving a real edge, and very crisp, fresh tannins. Delicious stuff, a little infill of smoky oak adding some silky depth. 91/100. Delightful nose, with some vegetal notes, a hint of truffle and crisply defined black fruit. The palate has lovely definition, a core of tight black fruit that helps this stay long and focused into a balanced finish. 92/100. Delightfully woodsmoky, schisty nose, the minerality and freshness apparant. Seems quite high-toned, but very attractively so. Lovely focus to the fruit with a really lovely mineral and herb edge and everything in lovely, spirited focus and balance. 92/100. Lovely smoky, very perky and bright nose with very refined fruit and the gentle minerality to the fore. The fruit has delightful cherry focus. ReaLly taut and precise, with a great juiciness and vitality. 90/100. One third each of new, w year and older oak from the best fruit. A cappuccino creaminess touch of torrefaction, but the lovely fruit quality comes through. More weight and texture n the palate, more concentration, but not over done. A little bit charry in the finish, but impressive stuff. 91/100. Coffe and malty notes, a nicely earthy and sweet berry fruit. Lovely sweet fruit freshness, with elegant tannins and a warming coffeeish finish. 90/100. Big, sweet, cedary nose with lots of herbs and spices. The palate has loads of substance, with plenty of extract and spice and loads of firm, solid fruit. Big but delicious. 91/100. Lovely cedary complexity, masses of fruit and a little more finess than the 2006. Balanced and deliciously moreish on the palate, the fruit has a much more sinewy, elegantly muscular character and lovely length. 92/100. Beautiful colour, and a beautifully elegant nose with charming red fruit, layers of mineral strucxture and a discreetly herbal edge. Beautifully focused and refined palate too, spices and exotic woodsmoke notes, but lovely fruit. 92/100. Lots of weight and thick, rich very sweet fruit, lovely beetrooty undertone but little herb and floral nuances too. Perhaps not the most structured of Pinots, but who cares when it is so delicious and so authentic. 91/100. Nicely smoky notes here and modest but delightdully fresh and focused fruit. The palate is nicely balanced, a little support from older oak and a certain juiciness. Adnams. 88/100. See all Central Otago wines on wine-searcher. Rudi Bauer is an Austrian winemaker who has been in New Zealand since 1985 off-and on, interspersed with winemaking jobs in Oregon, Germany and Burgundy. Having founded Quartz Reef back in 1996, he has observed the growth and the associated growing pains of Central Otago first hand. Central Otago is relatively isolated and is a challenging environment (at 45º South this is the world’s most southerly, and one of its coldest wine regions). But Rudi says he regards that as a great strength because “the winemakers were brought close together by adversity, though we also feel part of a worldwide fraternity of Pinot Noir growers.” He also speaks about the region as a whole, particularly how the land had been stripped by grazing sheep and nibbling rabbits over the decades, so that the soil are low in organic matter. To counteract this there is a widespread shift towards organic farming, and Rudi says in five to eight years he expects to see 30% of Central Otago’s vineyards being farmed organically. As a kid in Austria Rudi wanted to be a chef, but then developed an interest in horticulture and enrolled for winemaking courses in Austria and Germany. His first full-time job as a head winemaker was with Rolf Mills at Ripon vineyard in Central Otago though he also cites Larry McKenna, currently of Escarpment Vineyards in Martinborough, as one of his greatest influences. In 1996 Quartz Reef was planted on virgin land, a 50-hectare north facing slope. And it is obvious that continuing refinement of Quartz Reef’s wines is bound up in understanding each of his sites and plots better, and perhaps himself too: “Bendigo is a very masculine vineyard, my job is to introduce some femininity,” he says to the amusement of the audience. A touch of minerality, perhaps a tiny bit shy on fruit now, but lovely spice and a hint of florality. On the palate firm still, quite a lot of substance here, perhaps lacking a little charm with its liquoricy concentration, but built to last for sure. 90/100. Quite earthy and brackeny, deep and muscular aromas. The palate has serious, sinewy tannins and heft – a big wine this, muscular and foursquare, and perhaps a little too solid. 89/100. A little more open, soft and charming, with glimpses of softer, earthier tones and coffeeish notes. The palate too has been tamed and opened up slightly, much to the benefit of the wine. This still has a liquoricy edge of concentration and extraction, but some more light and shade too. 91/100. The more vegetal tones here are open and expressive, a touch of smoky minerality too and firm cherry fruit. The palate has complexity and more layered charm, again the firmness is there but this seems a lot finer and more agile than the 2006 and certainly 2004. 92-93/100. Blair Walter and Felton Road’s owner Nigel Greening (Blair is right of photograph) absolutely live the biodynamic and sustainable dream in their farm in Bannockburn. Lunch there was not only organic, but was sourced entirely from the farm including goat and chicken raised on the farm and a variety of herbs, fruits and vegetables. Blair Walter has been winemaker at Felton Rd “forever,” in his own words. In fact that means since the estate was founded in 1996. 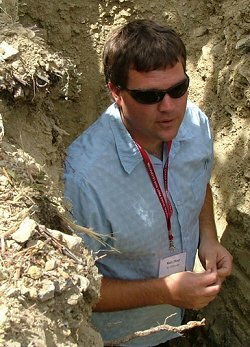 Though in his early days his ambition was to become a pilot, he was also a fifth generation Kiwi from a farming family background and the viticultural course at Lincoln university in New Zealand led on to further studies in Oregon, where his project experience was based on Pinot Noir. 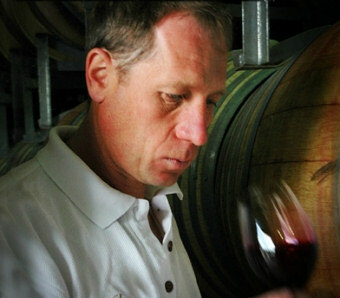 He worked for Newton Estate in Napa, then had winemaking stints in Australia’s Hunter Valley and Burgundy. But it was whilst he was working for Sokol Blosser winery in Oregon making Pinot Noir that Blair says he interest in what Central Otago might be capable of was piqued: “Rudi Bauer stopped by on a trip through Oregon and left me with a bottle of Otago Pinot which really opened my eyes: it was so fresh and floral.” Within a year he had returned to Central Otago to work with Rudi at Giesen estate, staying there until he was asked to help set up Felton Rd in 1996. Stony and mineral, with a gravel and slightly green, ashy notes to the fore. The palate has lovely , well-tempered fruit: this has a very sweet core of fruit, but it is balanced and has finesse, and has a light and shade about it. Juicy too, and a beautifully focused and long finish. 92/100. Very similar character, perhaps just a hint of more chocolaty depth and richness, but broadly in the same style as the 2000. Softer on the palate, the fruit a little silkier – very much black fruit – but that same elegance and effortless structure. 92/100. Slightly more closed, still that mineral sand stone quality, but not so giving as the 2003. Delicious fruit – tight, grippy, the tannins in this vintage more powerful, and even adding some spicy notes, but again that beautiful acidity and clarity of the fruit and this vineyard comes through. 93/100. Ripeness and richness are apparent. The vineyard expression is consistent, with that smoky edge of minerality, a touch of richness to the black fruit. On the palate a biggish wine, with abundant fruit, a little hint of damp undergrowth in a very true Pinot way, but the balance is excellent and has terrific length and focus again. 94/100. A tiny dank note here, a little little hint of rot, but then the fruit on the palate is very good and gives lots of solid, sweet pleasure with strawberry jam richness and quite a meaty, firm tannic background. Still drinking well. 90/100. Tighter and more mineral and smoky, a darker more concentrtated fruit character, but I like the tiny hint of fudgy warmth and this has very good fruit and balance on the palate – a fine, natural fruit concentrtion and good length. 91/100. Much more closed, less expressive at this stage. Seems to be quite a lot of oak and a certain chewiness. This has a spicy mass, though to me it seems a little too solid and lacks a bit of openness and softness that could push my score higher. 90/100. Quite spicy and smoky, a touch of cedar but also a little touch of open, more undergrowth quality. The palate has an orangey zest and life about it, and this seems to be a wine with a lot more energy in the mouth and a lovely sense of freshness despite a solidly tannic core. 93/100. The Central Otago Pinot Noir Celebration is a Pinot-fest for all, celebrating not only the local wines, but Pinot from across New Zealand and around the world. The most special relationship is, inevitably, with Burgundy. 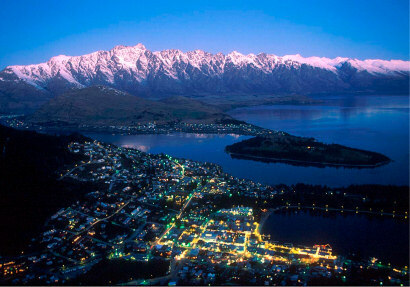 Each year a French contingent arrives in Queenstown to join in the fun and in 2011 the ‘twinning’ was cemented further by the signing of an agreement to from a Central Otago/Burgundy Exchange Programme which will see young winemakers from each region work vintages with their counterparts overseas. But the main business of this tasting, chaired by Rippon Vineyards’ Nick Mills, was a tasting of six premier cru Burgundies from the same vintage, paired because they come from vineyard sites that lie very close together, but which have different appellations. I was invited to speak on the panel conducting the tasting, along with New Zealand Pinot author and specialist John Saker and two Burgundian winemakers: Sophie Confuron of Domaine Jean-Jacques Confuron who has a long association with the Pinot Celebration, and Sylvain Pitiot. Sylvain was the main speaker before the tasting began, and an extraordinarily well qualified one. The panel from left to right: John Saker, Tom Cannavan, Sophie Confuron, Sylvain Pitiot and Nick Mills. The tasting was entitled “Natural geography or the cartographer’s pen – which delivers a more accurate delimitation of space?” In fact this was an exploration of the Burgundian ‘Climat’, a strictly defined geographical vine-growing plot with recognised and long established properties that distinguish it from its neighbours. And why was Sylvain Pitiot the perfect speaker? Well he is both the man in charge of the famous Grand Cru Clos du Tart, and he is, along with Pierre Poupon, the scholar and cartographer who drew the definitive and by now iconic maps of Burgundy that hang on many oenophiles walls. Sylvain’s fascinating talk covered the how, why and when of how the lines between Burgundies villages and vineyards were created, and some specific facets of geography and geology that influenced these boundaries, and the land on either side of them. He talked of rivers, slopes, churchyards and old roads that defined the area of the maps, and which in turn defined areas that would become some of the best climats of Burgundy. But of course the vines that had been planted there and the wines they made also influenced the precise lines where the original cartographers drew the boundaries. I’m not sure that the talk and subsequent tastings proved or disproved any particular theories, but it was just a terrific event with Sylvain’s talk and the tasting both riveting, and encouraging the audience to think about issues of history, culture and geography in relation to the wines. Lovely delicacy to the fragrance here, a sense of kirsch-like brightness and floral character. Delicious palate, the texture silky and quite voluptuous, the tannins melding with some coffeeish oak and smokiness, in a sultry, delicious wine. 93/100. See all stockists on wine-searcher. From an adjoining vineyard site, that trips over the appellation boundary into Pommard. More closed that the Comtes Armand, with much more earthy and vegetal aromatics. Less silky-sweet on the palate too, the fruit earthier, the structure more apparent, the finish arguably even a little austere. 91/100. See all stockists on wine-searcher. Ripe, much more aromatic again with a great concentration of aroma. It is vegetal too, with a truffle character and solid red fruit. The palate has a really decisive core of tannin but lovely length and a certain clarity of purpose as it powers through to the finish. 93/100. See all stockists on wine-searcher. Fine, ripe and plush coffee and berry-scented nose that is fragrant and appealing, with a blackcurrant and spice component. On the palate this is firm and quite imposing, the tannins powerful and the acidity notable. An attractive wine, if a little unyielding at this stage. 91/100. See all stockists on wine-searcher. A very elegant first impression here compared to the Lecheneaut, with a beautifully soft, briar and cappuccino warmth. The palate has deliciously juicy and sweet fruit, with a real luminosity, the long, sweetly-fruited palate showing fine tannins and a bright but integrated acidity. Very long, very focused and refined. 95/100. See all stockists on wine-searcher. A rather dull nose (particularly coming after the Confuron wine), with a little briar and undergrowth character but all quite subdued. The palate has a nice juicy fruit energy, but although not as tough in the finish as the Lecheneaut, still rather austere. 90/100. See all stockists on wine-searcher. Journalists and international guests of the Central Otago Pinot Noir Celebration are lucky enough to be invited to a private event before the start of the festivities proper, in which the Central Otago wine makers show their generosity of spirit by staging a large tasting of Pinots from other New Zealand regions. Because of flight timings I had to arrive late for this, catching only the last 35 minutes of a three hour session. Beautifully fragrant stuff, with sweet fruit and a certain meaty, bloody allure. The palate is filled with sweet fruit and there is fantastic, natural concentration here. Very appealing and has a really bright, tight edge of tannin to it that keeps it very long and focused. 93/100. See all stockists on wine-searcher. See all stockists of Canterbury Pinot Noir on wine-searcher. Waipara. Nicely schisty and mineral, with a tight oak structure, a touch of cedar. Firm, but fleshy, again a certain earthy rawness at this stage but has nice length and a spicy, full, fruity core with good tannins and acidity to balance. 90-91/100. Waipara. A touch of smoky minerality here, a nice level of oaky spice and coffee in the background. On the palate there is perhaps a touch too much oak/too little fruit? Certainly at this young stage it has a touch of rawness, but good component parts. 89/100. Waipara. Nice, attractively fruity nose with some exotic, incense nuances and on the palate, loads of easy-to drink, appealing tannins and very silky structure. This is such lovely quality commercial stuff, staying quite lean but harmonious, and super slick without being at all vulgar. 89-90/100. Waipara. Spicy, full red berry nose, very forward and juicy, perhaps a slightly lemony sharpness about the acidity that is a little awkward, though I like the juiciness of the fruit and the softening touch of oak helps ease out the finish. 88/100. Waipara. Very refined minerality again here, capturing lots of fresh, lightly earthy character and brightly focused raspberry fruit. The palate is gripped by very tight acidity and plenty of tannin, as well as that juicy fruit. Deliciously energetic and a smooth, deep fruit structure beneath, and tastes very youthful. Terrific tang and verve. 92/100. North Canterbury. Extremely pale colour, verging on tawny at the rim. Fantastically soft, coffee and leafy, truffly damp undergrowth. The palate has very soft structure, delightfully delicate and pure, the wine definitely feeling mature and if I’d to guess, with considerable age. An intriguing wine that I need to understand more after I visit them. 90/100. Canterbury. Fine smokiness and flinty quality, lots of ashy minerality. Tight, nice quality of oak here too, with plenty of red fruit coming through. The palate has real sweetness of fruit again; a silky, full texture and plenty of dark, sweet oak, but the spice and acidity of the structure is enough to balance and this is big, sumptuous, but beautifully done. 92/100. Waipara. A slightly oxidised, slightly dried blood character here, but lots of iron filing minerality as well as obvious ripeness. The palate has delicious flesh and weight, that open, briar and chocolate richness and huge sweetness of fruit really filling out. Delicious, and has energy about it, if the acidity perhaps not just as harmonious as some. 90-91/100. Waipara. Dominated by herbs, spices and much earthier and more mineral and older wood tones, the cranberry-dry fruit settled nicely in. The palate has lovely tang and freshness. There’s coffee and a touch of liquorice, but the sweetness inherent in the mid-palate fruit powers through, leaving this deep and flavourful. 92/100. Waipara. Natural cork. More restrained than the Bell Hill for sure, with a smoky mineral quality, briary notes and a sense of cool restraint. The palate has deliciously sweet and focused fruit: there’s that restrained feeling again, the gently earthy and smoky tones, nicely balanced acidity and the tang of the cherry skin fruit and brisk tannins. 91/100. North Canterbury. Beautiful nose, nicely vegetal Pinot aromas of rhubarb and beetroot, but delicious truffly notes too and masses of ripe, luscious berry fruit over a chocolaty background. On the palate the sweet fruit sings out, masses of chocolaty, ripe berries and plum, great structure too with refined tannins and a silky weight of fruit clearly delineated by the acidity. 94/100. From vineyards on an alluvial river terrace, not on limestone. Nice, light, lemony nose with a touch of light saline. The palate is very dry, with a racy, lime and lemon freshness and lovely delicacy. 88/100. Quite an elegant, lemon rind and lime and note that is a little more sparky, lightly waxy note. Fantastic punch and verve on the palate with that same delicious shimmering balance. Long and beautifully tapering and elegant in the finish. 91/100. One third in big, old oak barrels. Whole cluster, wild ferment. A tiny little pear skin note and a touch of lemon rind, very much focused on a tight fruit quality. The palate has a dry character, with lots of that lovely pithy, lemon and grapefruit punch to the acidity. This is fine and very racy, and has a real bite and lightness. 13.5% alcohol with plenty of punch. 90/100. Has a lot more fat and sweet vanillin richness on the nose, a clean melony fruit and a lovely, with a touch of honey and lots of apple pie fruit. Slightly short on the finish, but really nice crisp acidity and balance. Drinks beautifully. 89/100. From a clay-rich limestone moving into alluvial soils. Partially foot-trodden, this has a rounded, appealing, lightly honeyed quality, lightly honeysuckle. Has a touch of melon and peach ripeness, but the stone fruit comes through and is delicious and taut. Very nice palate, plenty of dry acidity and a tight fruit definition into a long finish. 89/100. 100% wild yeast and 25% new French oak. Grapes were 100% de-stemmed, but that philosophy is changing. 14.3% alcohol, the highest to date. Lovely fragrant oak, with a tight spiciness and light cherry and cherry skin fruit, a touch of liquoricy concentration. Superb palate, a tight raspberry and cherry juice quality, wreathed in delicate smokiness and with a tight, lightly herbal edge that really focuses the finish. 92-93/100. Lovely soft nose, with more earthy open-textured raspberry and red cherry fruits. There’s a big orangy acidity here, a real tang of fresh, citrusy acidity as it hits the palate, with tight structure of the tannins. Again that chicory and liquorice bittersweet quality is lovely and has a tight, structured palate that will soften over coming years. Less bold and deeply-fruited than the 2009, but has energy and edge. 92/100. Still quite a solid, deep colour. Gorgeous Pinot development here, with some truffle and damp, undergrowth notes, the soft red berry fruit nicely mingled in there. The palate has a little vegetal quality suggesting less ripeness than the 2009 certainly, but it is attractively lithe and sinewy, with tight acidity that is perhaps just a little prominent, but again a very fine wine. 90/100.